If you are wondering why a vast amount of third-party ads, pop-ups, and coupons are being presented to you within your web browser, it is likely that your computer has an adware application running on it. One such program is known as FitnessLance and it has been recently noticed to be roaming the web. Keep in mind that the dubious application is not region specific; thus, users all around the world could come across it. The category of an adware has been assigned to this program due to its invasive nature. Avoiding it is paramount if you do not want to ruin your online experience. Even though it is advertised as a tool that should improve your Internet experience by providing numerous fitness tips, it will do the complete opposite of it. On top of making your overall online experience an annoying and frustrating one, this ad-supported program could also expose your computer to other suspicious applications, meaning that it could turn out to be a major virtual threat. 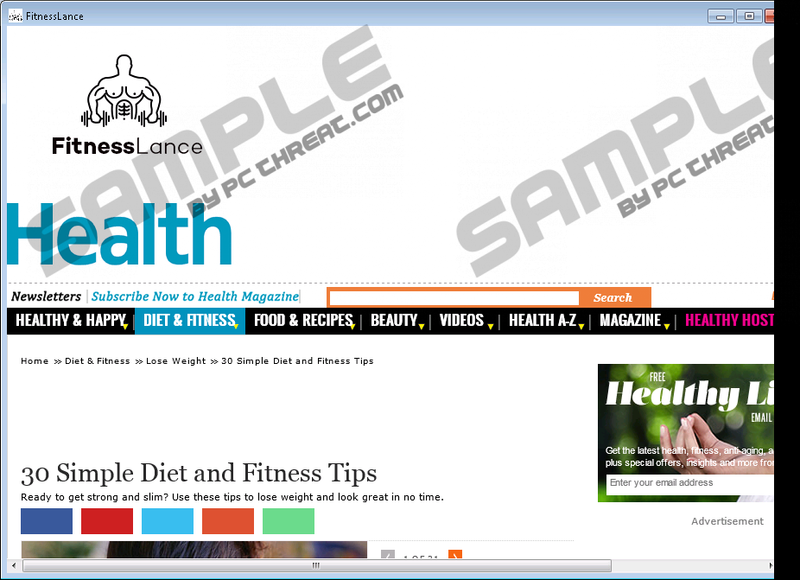 Do not take chances with FitnessLance and remove it from your PC. You can do so in a simple way by following the instructions that we present below. The overall functionality of FitnessLance is not too complicated since it closely mimics the operations of other programs that belong to the same category. Once this adware successfully enters your operating system, it will launch a background system service and establish connections to numerous adware servers. The connections to these servers are the main reason you will see invasive web content within your browser. While the idea to kill the system service and so to breakdown the suspicious connections to those dubious servers is a good one, you must be aware of a few critical facts. Firstly, the name of the system service could be completely random; thus, identifying it without advanced computer knowledge could turn out to be more than difficult. Secondly, by stopping the service via a Task Manager will most likely not stop the functionality of this adware entirely as it will restart itself with the next system startup. All the content presented to you by this ad-supported program is utterly worthless and will only cause annoyance. In fact, at times, this application could provide so much of invasive ads, pop-ups, and coupons, that surfing the web in a usual way could turn out to be almost impossible. If you wish to terminate the suspicious activity of FitnessLance completely, you need to conduct a thorough removal of it without any hesitation. Unfortunately, this is not all that FitnessLance does. In reality, there is much more to it that meets the eye. Since this program is usually spread via software bundles, there is a high chance that other questionable programs are active on your PC, especially if you did not install this adware consciously. This is the reason we firmly advise you to conduct an in-depth analysis of your PC for suspicious and even malicious software. Additionally, this application could operate as a gateway into your computer for other intrusive applications. This is so because, during its activity FitnessLance will be able to connect to the Internet without any permission and so during those connections it could trigger silent downloads, which could turn out to be of dubious and even malicious software. Even though this does not happen often, it still remains a possibility that could have unwanted and devastating outcomes, to put it mildly. Every security conscious user should remove this invasive application as soon as it is discovered fully running on their PC if they are keen on keeping their computer safe and secure at all times. The removal of FitnessLance should not be delayed under any circumstances as it will only increase the chances of infecting your personal computer with additional malware. Make sure to take the procedure seriously as a single mistake could have detrimental outcomes. Even if you miss a single step, crucial files or registry entries of FitnessLance could still be used to silently restore it or to continue its unwanted operations. A paramount thing that must be done right after the manual removal is an in-depth analysis of your computer for potential traces linked to FitnessLance. If you find such analysis too challenging and do not wish to tweak your registry system on your own, you can alternatively perform a full system scan with a reliable antimalware tool. Locate and select the unwanted program. Right-click FitnessLance and select the Remove option. Quick & tested solution for FitnessLance removal.